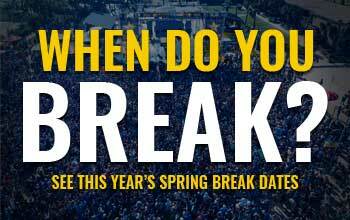 School is only about six weeks in, but you can bet that Spring Break is already a trending discussion on campuses nation-wide. We’re less than six months away from the hottest college event of the year, so why not start talking about where you’re headed and most importantly, where you’re going to stay when you arrive for the best week of your college life! If you’re planning on spring breaking in Panama City Beach, hotels are already offering major discounts on rooms, but of course, for just a limited time. Check out our Where to Stay Page for all your Spring Break Hotel and Condo Options! The Beach Bash Music Fest at Sharky’s Beach Club will have even more high profile performances. The parties will be amazing, as always! Keep visiting us at www.pcbeachspringbreak.com for all the updates on Spring Break 2017 each week as we get closer to the biggest student party of the year!